Consumers and chefs are clamoring for heritage-breed pork. Can the market support both farmers and pure-bred animals? 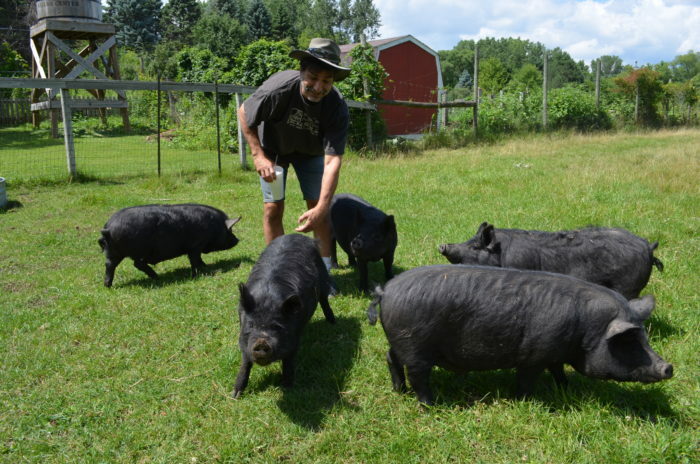 In the winter of 2014, near Cambridge, Ontario, farmer Murray Thunberg made plans to acquire seven British Saddlebacks—lop-eared, black pigs with a white band running across their shoulders—with the intent to breed them. Thunberg already breeds Berkshires, Tamworths, Herefords, and Gloucestershire Old Spots, but the Saddlebacks are an especially rare heritage breed that hadn’t been registered in Canada for 30 years. He set up a GoFundMe campaign, raised over $2,000, and bought the small herd from a farmer in Vermont, becoming one of only a handful of farmers raising them in North America. At the time, he explained his rational for taking on such a complex endeavor: “By breeding and raising heritage [pigs], some very precious genetics are being saved and expanded.” Now, he considers himself a guardian of the Saddlebacks; after four years of breeding the animals, and selling some to local chefs and farmers’ market customers, the herd has expanded to 18. Until the late 1930s, heritage pigs were the norm on family farms, where they had access to pasture, forests, mud bath wallows, and good bedding. Their fat was seen as essential to human health. “Today those breeds do well on pasture because they have not lost their instincts to forage and graze,” says Ross Duffield, former farm manager at the Rodale Institute in Pennsylvania, an organic research farm with a mandate to work with heritage breeds to improve the soil and help farmers create a high-quality product. Those foraging instincts were problematic for industrial agriculture, however. Heritage pigs can go stir-crazy and become aggressive in confinement, forcing many breeds to the brink of extinction, out-competed by pigs bred to grow fast and tolerate crowding. On these large, confinement-based operations, where thousands of hogs are typically raised in one barn, the animals are engineered to grow to market weight in around six months. Heritage breeds, on the other hand, can take a year or more to reach market weight. For all these reasons, heritage pork can cost 3-5 times as much as the meat from conventional farms, and has remained a niche market, even as consumers and chefs alike fawn over its exceptional marbling and rich porky taste. Yet as many farmers turn to crossbreeding to help manage costs and scale up operations, some experts worry the term “heritage” may be losing its meaning. The Livestock Conservancy calls animals “heritage” if they have a long history in the United States, are of non-commercial stock, can thrive outdoors and on pasture, and are “purebred animals” of their breed. The term can also be used for the “immediate offspring of purebred heritage breed parents.” In other words, a farmer can take a Saddleback and cross it with another heritage breed such as Tamworth, and still call the offspring from that cross “heritage” animals. The U.S. Department of Agriculture (USDA) doesn’t define the term when it comes to pork, and those with a stake in the business don’t expect it to do so anytime soon. “Heritage was an easy concept to grasp, and it worked for a while until people realized they could make a buck off it,” says Jeannette Beranger, senior program manager at the Livestock Conservancy. She added that the organization is currently considering shifting to the British model, which identifies these pigs by pedigreed breed only, and ditching the term “heritage” all together. “It doesn’t carry any power because so many people are using it loosely,” says Beranger. The challenge is that a term that began as a way to preserve endangered breeds has also become a popular marketing term for many farmers. Although “heritage” meat has caught on with foodie audiences around the country, and commands a price premium, the two goals—profit and preservation—don’t always go hand in hand. The core challenge is the fact that the majority of farmers who use the term heritage to sell their meat don’t maintain a purebred herd, but instead buy purebred animals to cross. Another breed consumers and chefs believe is synonymous with the term heritage is the Berkshire—but they don’t fit the Livestock Conservancy definition, either. “The Berkshire is a grey area that we go back and forth on,” says Beranger. “It’s almost impossible to find a good old-fashioned Berkshire because they’re all crosses.” Farmers register their animals with the 750-member American Berkshire Association. Berkshires’ meat has excellent marbling after growing for six to eight months, making them more affordable to produce. Farmers can either work with the purebred character, crossing them with other Berkshires to improve genetics, or crossing them with a faster-growing breed such as the Pietrain for productivity. How important is purity in this discussion? That depends on whom you ask. With no definition or regulations there’s been a rush to stake a claim in the expanse between commodity and purebred heritage pigs and capitalize on it. “There are very few purebred programs and none of size,” says Kerri McClimen, senior communications director at Niman Ranch, owned by Perdue Farms. Like Rodale, their program relies on heritage crosses that may include breeds like Tamworth or Hereford, as well as other faster-growing breeds. They raise them following practices commonly used for heritage pigs, but don’t require their breeds to be registered, and don’t market the meat as heritage. 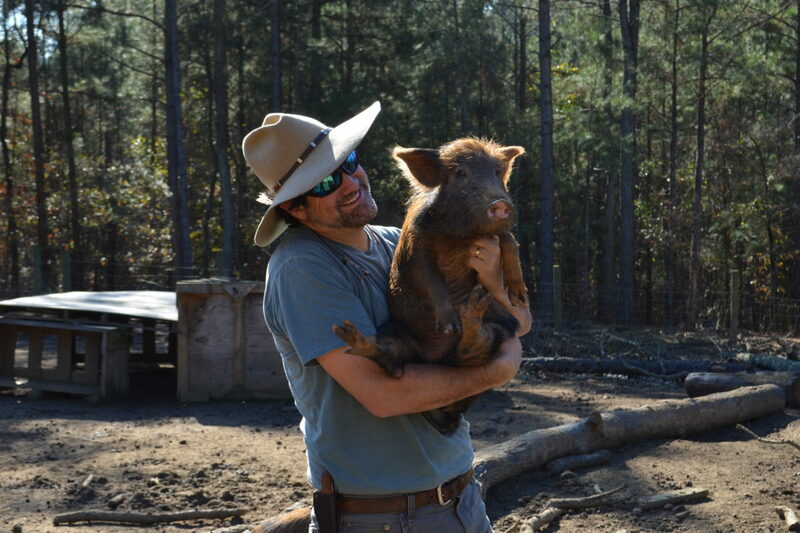 As McClimen suggests, most purebred heritage pig operations are small and, by extension, don’t enjoy the marketing and distribution advantages of a company like Niman Ranch. Beranger worries the purebred heritage breed may never scale up if big farms don’t contribute to available genetics by breeding their own purebred animals. McClimen agrees, and adds that some Niman Ranch farmers do invest in purebred heritage pigs. “We partner with several genetic companies representing large populations of purebred animals,” she says. Traditionally, only a small percentage of the animals in each herd had qualities worth breeding for, but Beranger worries that the rush to meet the demand of a burgeoning market is changing that approach. “Breeders are selling all their pigs when only the top 10 percent are breeding quality,” she says. 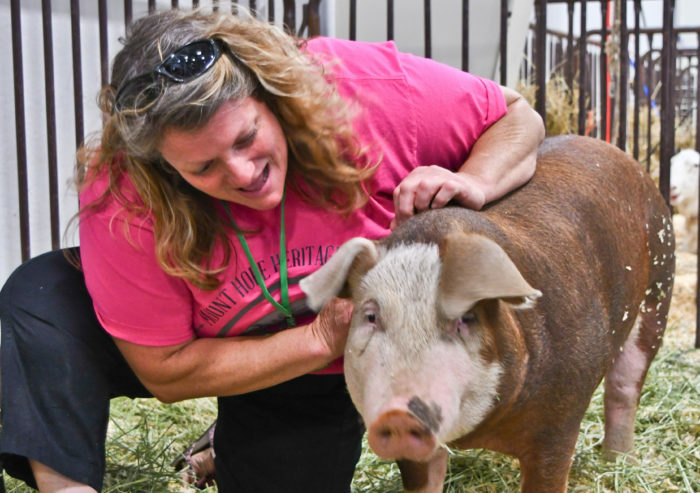 “As a result, subpar pigs are bringing in a pretty penny.” The Livestock Conservancy wants to create a marketing advantage for breeds that need more stewards. One possible solution is to offer an incentive or subsidy to farmers protecting purebred bloodlines. Because raising purebred heritage pork is so costly, farmers can rarely afford organic feed, so certified organic heritage pork is a niche within a niche. Duffield looks to the current trend of generational transition of land and to first-generation farmers as a source for possible growth in the organic heritage pork market. Rodale attracts farmers wanting to adopt their methods in part by making a good business case. Currently, he adds, that’s only possible if farmers are raising heritage crosses. Take Kate Farrar of Perianth Farm in New York’s Hudson Valley. She’s a first-generation farmer who raises Berkshire pigs with a friend on a farm they rent. She likes the breed’s gentle, friendly nature and gives the herd the best life possible; they live outdoors with a mobile hutch to protect them from rain, she rotates pasture weekly, and feeds them an organic diet. The financial potential of the niche market attracts farmers to pigs like these, but to sell the pork they have to hustle. Farrar sells farm shares through a community supported agriculture (CSA) subscription and through a farm-to-table mobile app. And—like many farmers—she uses the term “heritage” in her marketing, despite the fact that Berkshires aren’t on the Livestock Conservancy’s list. She doesn’t have the infrastructure for breeding or wintering, but she hopes to in the future. If she does, Farrar may use the same model farmer Gra’ Moore has perfected on Carolina Heritage Farms in South Carolina, where he raises several official heritage breeds as well as one of the nation’s only herd of Guinea Hogs. Moore is a rare example of a producer striking a balance between the often-opposing priorities of business and conservation. “He maintains purebreds, but his money-makers are the crossbreds, which is what makes chefs happy,” says Beranger. A well written and informative article until the last paragraph which reads " one of the nation’s only herd of Guinea Hogs". The American Guinea Hog is a beloved breed that has come back from the brink of extinction due to the efforts of many dedicated breeders. We have over 300 long time members, including dozens of breeders who have secured the future of the breed by focusing on preserving foundation specific lineages in their herds. While Gra'More certainly has some important genetics at his farm, he has only one of many herds of purebred Guinea Hogs. For more information, visit our website. Thank you! "Carolina Heritage Farms in South Carolina, where he raises several official heritage breeds as well as one of the nation’s only herd of Guinea Hogs"
Did Gra Moore pay for that statement? There are herds of American Guinea Hogs all over the country. We have a herd of over 50 AGH in central Texas. I really liked the article right up to the last paragraph. Very enlightening for this consumer who buys pasture-raised pork weekly. 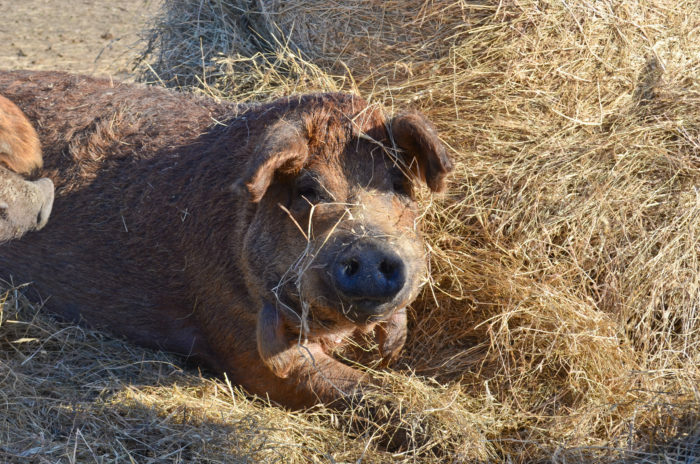 Hmm... Ossabaw pigs are in fact heritage AND a rare breed noted for their exceptional fat to meat ratio. They are small and definitely forest hogs. We have them. It's what George Washington had and Mount Vernon (in Virginia) runs them to this day. They are HARD to come by pure since the state of Georgia will not allow them to leave the island off of their coast. Anyways! we love them for their temperament (when raised correctly they are like dogs) and their delicious lard and meat! not much bacon but the chops and other num nums you get from them (sausage and other types of meats) is awesome! Every time you shop you vote. This is a well-thought out article that educates the public. The more awareness the better! Kudos to Kate Farrar of Perianth Farm for providing such a good life for her animals.